Hay Day is the number one rated farming simulation available, it’s created and published by Supercell. 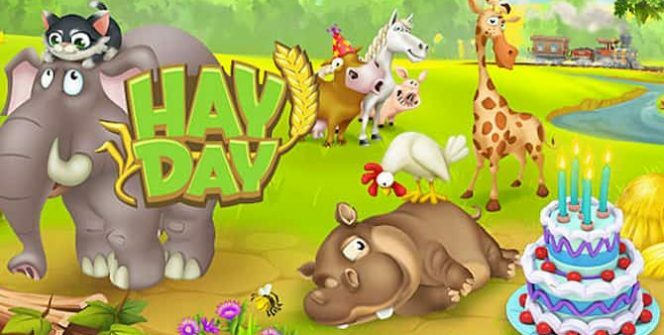 If you’re tempted to download and play Hay Day, continue reading to discover a few reasons why Hay Day is so popular. In Hay Day you’ll get to build a thriving farm and will have the opportunity to trade the items which you produce with your neighbors. As your farm grows from strength to strength, you’ll also be able to transform the town, which your farm is located in and to welcome guests to your town. 1. It features a great trading system. There are multiple ways to trade the goods which your farm produces. When you first start playing Hay Day, you’ll start off by trading fresh produce from a small road side shop. However, as your business takes off you’ll be able to start fulfilling larger orders by truck and steam boat. 2. There are multiple ways to increase your profits. While you may choose to concentrate on harvesting fresh produce, there are multiple ways to increase your profits. As an example, once you have enough resources to fix the dock in your town, you’ll be able to start catching fish, in order to increase your profits. 3. There are fun, limited time missions to complete. From time to time visitors to your town, will turn up and present you with special missions, which are well worth completing. As an example, one visitor may offer you a large amount of money for a large order of 200 eggs. 4. It offers slick, smooth controls. While there are countless farming simulations which are available to download, Hay Day is unique as it’s controls are so smooth, that scrolling around a massive farm is simple. If you’re sick of playing simulation games which freeze up as you navigate around your map, you’ll really enjoy playing Hay Day. 5. 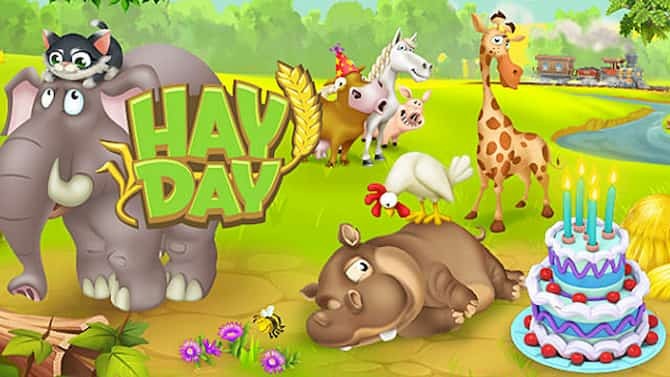 Hay Day features a wide variety of livestock to raise. If you assumed that you’d only be able to harvest grains, fruits and vegetables, think again. In Hay Day, you’ll get to raise a wide variety of livestock such as chickens, cows, sheep and pigs. All of which are adorably animated. If you’re unsure of which animals to raise first, you can’t go wrong purchasing chickens as they produce eggs which are a highly sought after commodity. As well as sheep, which of course produce wool. 6. 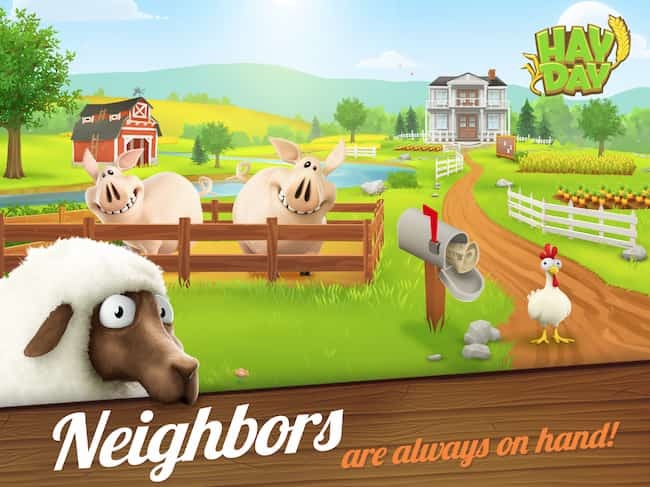 Hay Day encourages individuals to upgrade their farms. As an example, in order to be able to raise horses in order to complete a mission, you’ll need to build a stable to house your horses and in order to increase the amount of grains which your farm produces, you’ll need to build and paint new grain silos. 7. It offers cute, vibrant graphics. One reason why you can easily spend hours playing Hay Day is that it boasts cute, high definition graphics. That will convince you to keep checking in with your farm, throughout the day. So if you like the sound of living out your fantasy of being a successful farmer, it’s definitely well worth downloading Hay Day for PC. Sometimes when playing Hay Day, bluestacks ask you fee to pay but gives you option to download some apps. Every time it asks you just select “Install apps” and continue using it free. I hope you enjoyed this article, please rate and share. If you have problems running Hay Day on your desktop or any other issues, leave a comment below.